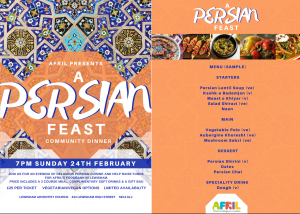 AFRIL is a community led organisation in Lewisham which supports refugees, asylum seekers and other vulnerable migrants in South London. Our aim is to empower people to help themselves by assisting them with access to services, resources and advice. Alongside our advice and advocacy work, we also run a Saturday School for children, various projects aimed at alleviating poverty and isolation, as well as our Helping Hands Foodbank, which runs each Saturday and supports families who are affected by food poverty. Each week we provide 20 families with staple food items, as well as delivering advice sessions and activities which work to resolve the causes behind users’ destitution, ensuring they are helped to move on and do not become dependent on the Foodbank. The funds raised from the tickets to the Community Dinner will be going directly to the core running costs of our Foodbank. Tickets are £25.00 per person, for a 3-course meal including complimentary soft drinks and a gift bag.